One of the project concepts we would like to share is the A. bar. 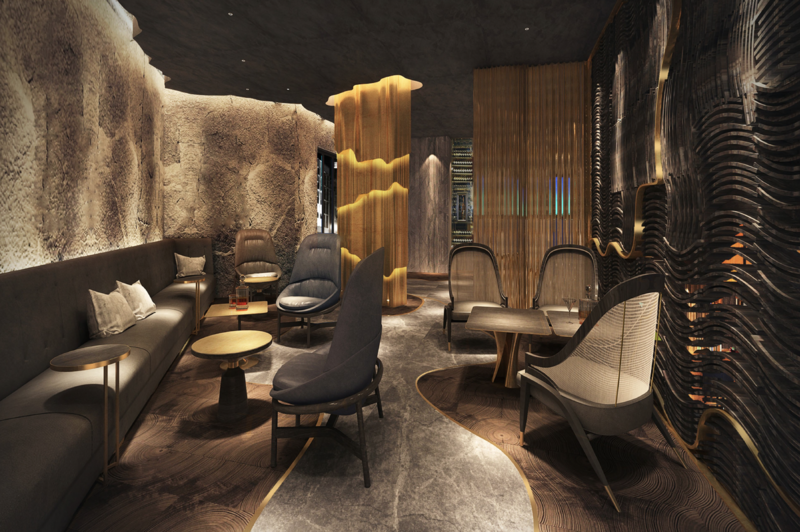 Like the feminine name suggests, the bar’s concept is based on a lady’s figure and her personality. A strong feminine presence spread though out the bar. It is modern, unique, endearing, and luxurious at the same time. Together with curvy lines, material choices play a great deal in developing a woman's personality. She is a woman of contradictions, soft and tactful at times, but stern and assertive when she needs to be. That is why material use must be precise and diverse. D&P decided to stick closely with wood, stone, leather, and copper. Swift, alluring patterns on natural wood embody her free, adventurous soul. The use of tough stone represents her bold, daring personality. Next, leather in ultra-diverse shapes and forms symbolizes her sensuality. Finally, her gracefulness is implied by the dazzling gleam of coppers. The architect team imagine her foot journey across various places and base on that to plan the layout. In the bar area, the island bar pops right up under the elegant brass veils that guide lighting down. The idea is make the bar feels like a charming dress. The whiskey lounge uses raw stone to boast toughness and endurance while working with lighting to create a romantic, easy-going ambiance. Finally, the Great Gatsby room makes a fine dining room with its stimulating lighting and luxurious interiors. All in all, the charming the A. bar welcomes those who are daring enough to bring themselves to her. It is not just a place for pampering, it is where you feel and connect. One of the project concepts we would like to share is the A. bar. 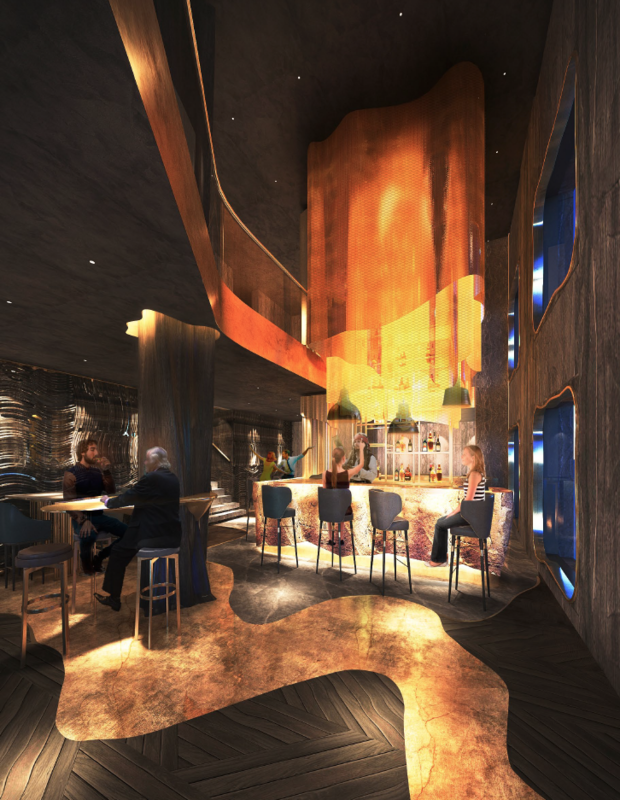 The bar’s concept is based on a lady’s figure and her personality. A strong feminine presence spread though out the bar. It is modern, unique, endearing, and luxurious at the same time. One of the project concepts we would like to share is the A bar. Like the feminine name suggests, the bar’s concept is based on a lady’s figure and her personality. A strong feminine presence spread though out the bar. It is modern, unique, endearing, and luxurious at the same time.Together with curvy lines, material choices play a great deal in developing a woman's personality. She is a woman of contradictions, soft and tactful at times, but stern and assertive when she needs to be. That is why material use must be precise and diverse. D&P decided to stick closely with wood, stone, leather, and copper.Swift, alluring patterns on natural wood embody her free, adventurous soul. The use of tough stone represents her bold, daring personality. Next, leather in ultra-diverse shapes and forms symbolizes her sensuality. Finally, her gracefulness is implied by the dazzling gleam of coppers.The architect team imagine her foot journey across various places and base on that to plan the layout. In the bar area, the island bar pops right up under the elegant brass veils that guide lighting down. The idea is make the bar feels like a charming dress. The whiskey lounge uses raw stone to boast toughness and endurance while working with lighting to create a romantic, easy-going ambiance. 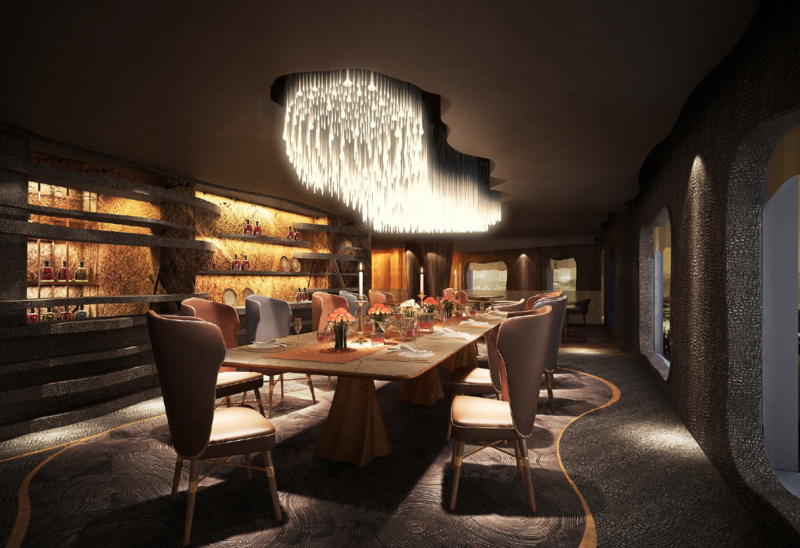 Finally, the Great Gatsby room makes a fine dining room with its stimulating lighting and luxurious interiors. All in all, the charming the A bar welcomes those who are daring enough to bring themselves to her. It is not just a place for pampering, it is where you feel and connect.